I am super thrilled that I get to Show Off & Brag about Kelly at Eclectically Vintage today. 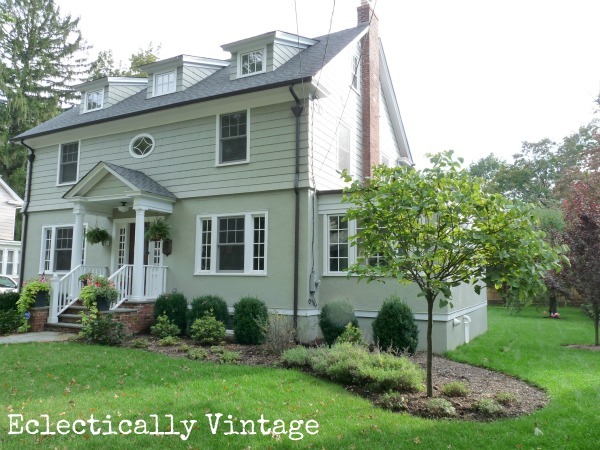 Wait until you see her home and how she took a 100 year old beauty and totally renovated it. You will love her style and she is also the sweetest lady, always such a gracious blogger and person. I’m Kelly from Eclectically Vintage and I'm thrilled that the amazing Marty asked me to join her here today! I live in this 100 year old house on a tree lined street in New Jersey (no, Snooki is not my neighbor). We renovated the whole house - you won't believe the before! I got my dream kitchen with a red stove taking center stage. 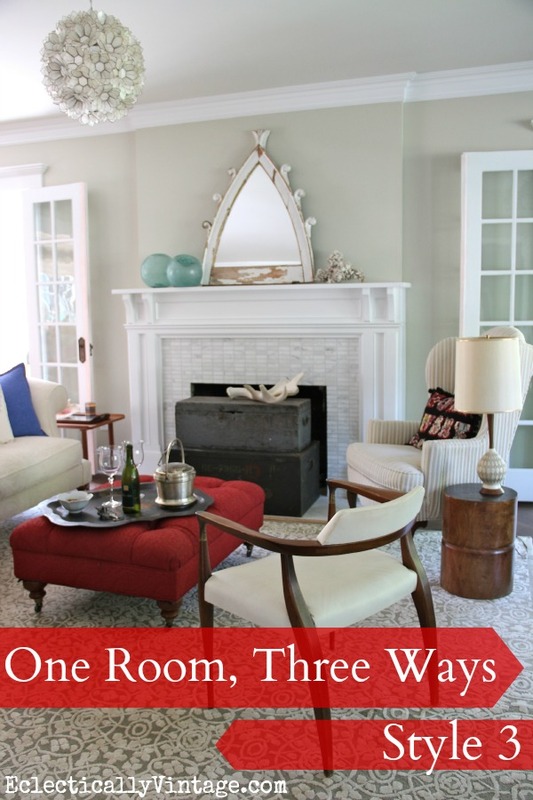 One of my favorite posts was how to decorate one room three different ways ... while spending $0! 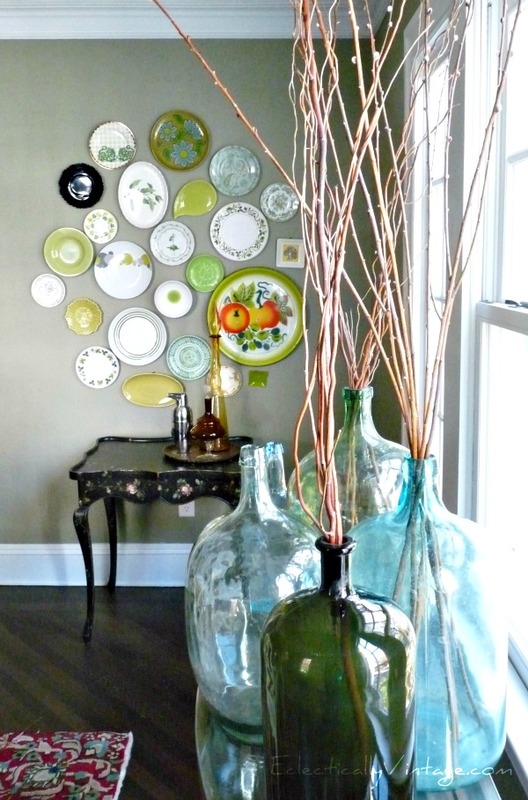 I've never met a plate wall I didn't love ... and I used coloring book pages as art on the other wall in my dining room. I also love simple projects - if it takes too much time, I'm not going to do it! An old window found in my neighbor's dumpster turned into this monogrammed glass (total cost - 18 cents). 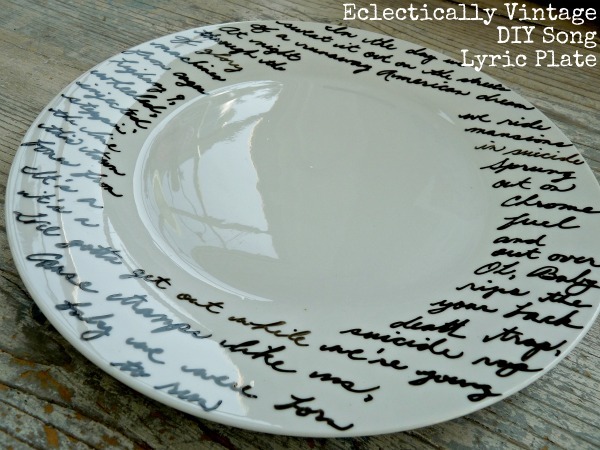 A personalized song lyric plate for less than $2 ... and it's not a Sharpie! 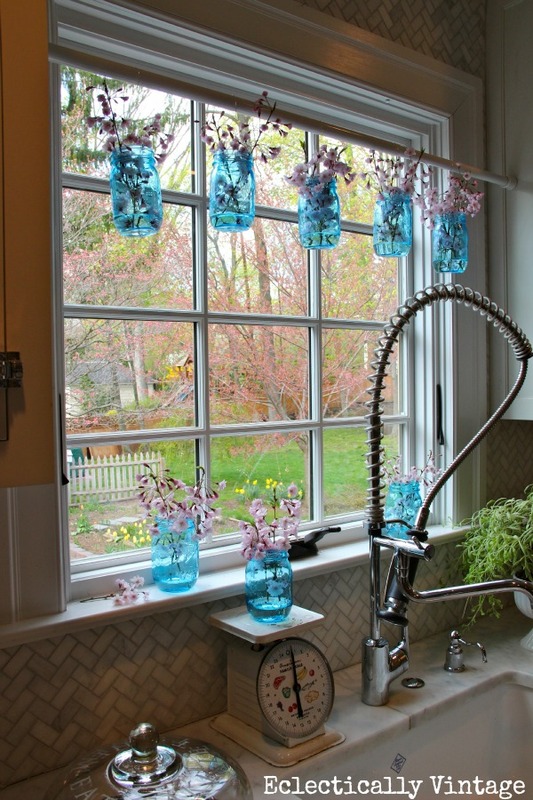 How about a mason jar window treatment where I share the easiest way to wire the jars. Hope you'll come visit me at Eclectically Vintage and check out all My Simple Projects and my full House Tour. Or follow along on my thrifting adventures (see one of my favorite finds - an antique wallpaper pasting table). Thanks so much Marty for the invite! Cheers! 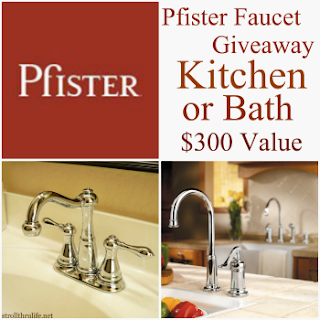 While you're here don't forget to enter to win a beautiful Pfister Faucet. Choose any faucet with a value of up to $300 to update your kitchen or bath. They have all the latest styles and finishes. Hurry and enter, winner will be announce on August 19th.Remember, you can enter every day to increase your chances. Thanks Marty for the introduction! I love the peek into her house and projects. Going over to follow her right now! Love that plate wall! Sweet,sweet kitchen. 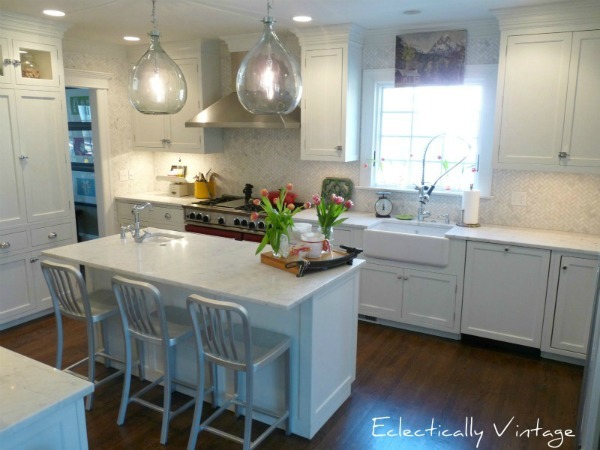 Such a charming and beautiful home....love her kitchen!!! I love Kelly and her beautiful home...Kelly is so very talented and creative and it shows in her home...i love reading about her projects, decorating and adventures in thrifting/antiquing...!...Loved seeing her home here today Marty...and have a wonderful weekend! Hi Marty! What a wonderful tour. She certainly puts a modern touch on her olden home. I loved it. Oh this is wondrful Marty, this lady is so artistic and creative! Thanks for the tour. Kelly's home is beautiful. I have to say love that red stove brings such character and whimsy to her kitchen. Love the blue mason jars for a valance in the window how cute and clever is that!!!! Kelly has a beautiful home. Thanks for sharing this with us Marty. I love Kelly's home! She's given me quite a number of ideas... Thanks Marty! Kelly's home is beautiful Marty!Thank you for sharing! Hey Marty- thanks for sharing another fabulous blogger. big fan of kelly's blog and her style. Have a wonderful weekend. first time here, love the plate wall and your kitchen is Fab! Will be newest follower, nice to find you. What a pretty house! I love Kelly's style! Wow. What a gorgeous house. Thanks for sharing! Love her style! That mantel is gorgeous. Thanks for sharing with us at TTF this week. Love, love these ideas! The blue mason jars hung on the curtain rod just did it for me! So many other lovely things too...like that plate wall...OMG! Beautiful share today! I love peaking into other people's homes. I think that is one of my favorite things about blogging, plus the friendships. I got to get my plane ticket soon...can't wait to see you again! Thanks for introducing Kelly to all of us in your Show~Off series!!! 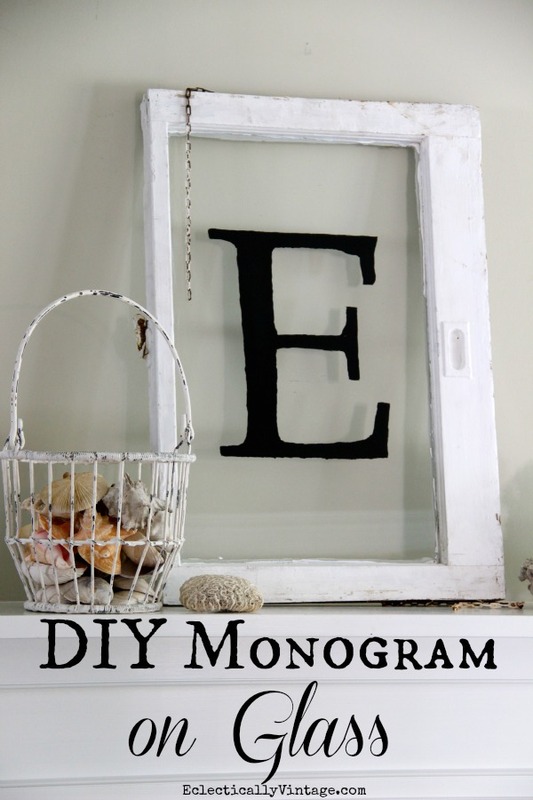 Love her monogramed vintage window!!! Pfister Two Handle Bridge Kitchen Faucet! I love love love these! We have two separate units right now with a sprayer. I would love the two in one!